Pregnant Hungry Sharks at Guadalupe! I saw today the biggest great white shark I have seen here at Guadalupe Island on board the Nautilus Explorer: “Dotty!” We estimated her to be at least 5 meters (16-17ft) in length and she is gorgeous. She does not have a very scarred body like the other ‘Big Mommas’ we see around here and she is a slow moving shark but she showed us some impressive speed swimming skills when she headed for the bait a few times, and did a very long close pass by the cage. 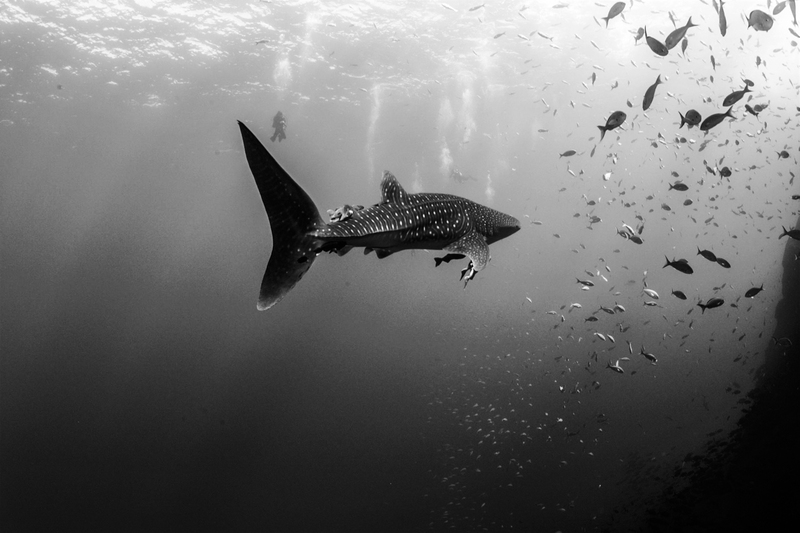 When she emerges from the blue in the distance, it seems like a whale shark is swimming towards us! We had a total of 4 sharks at the same time around the cages and we saw 12 different ones over the whole day. The visibility is crystal clear at 30mts+ (98ft), the water is 21°C (70°F) and the seas are as flat as a lake. 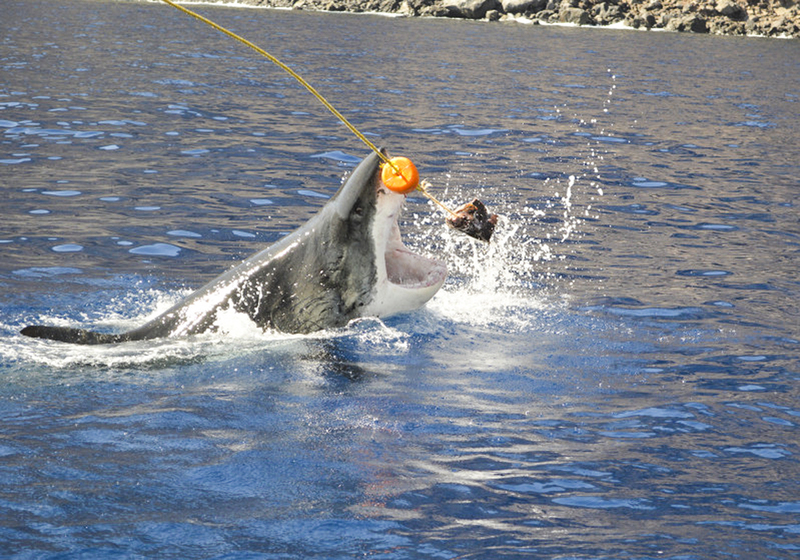 Another great day in Guadalupe Island! Today was the second day in Guadalupe and the diving conditions are awesome! We had many sharks these past two days and the ones that stay the longest are “Dotty” and “Donna” (big females) and “Kenric” (male). Good visibility and no current, and the guests and divemasters are very happy. Tomorrow some sharks will be tagged to learn more about their behavior. 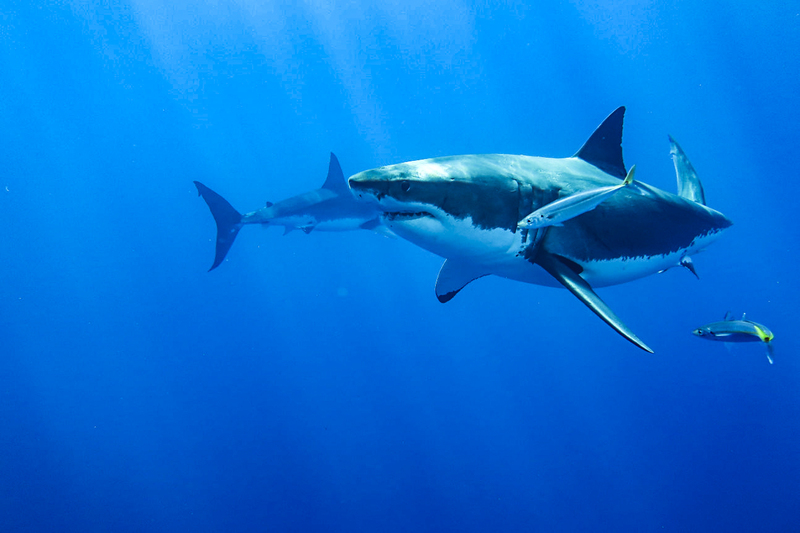 What a great first day of diving with the great white sharks at Guadalupe Island! We started wrangling and cutting our tuna on the back deck at 545am, and only a couple minutes passed before the first shark appeared! Everyone got into their wetsuits and started loading the cages so it was a full house by 6:40am! It wasn’t too long before the 1st breach of the day after that! They were HUNGRY! The sharks kept coming, getting close to the cages, almost like they want to be famous! There was some great eye to eye contact! We have also had great visibility as always! 140ft plus, no wind, a little cloudy though, with the sun only coming out a few times during the day. 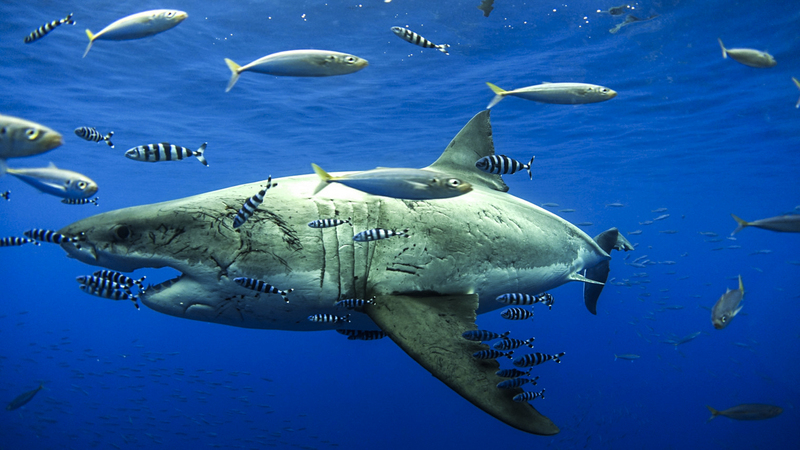 A great white bursts out of the water after the tuna. What a beautiful first day of diving. 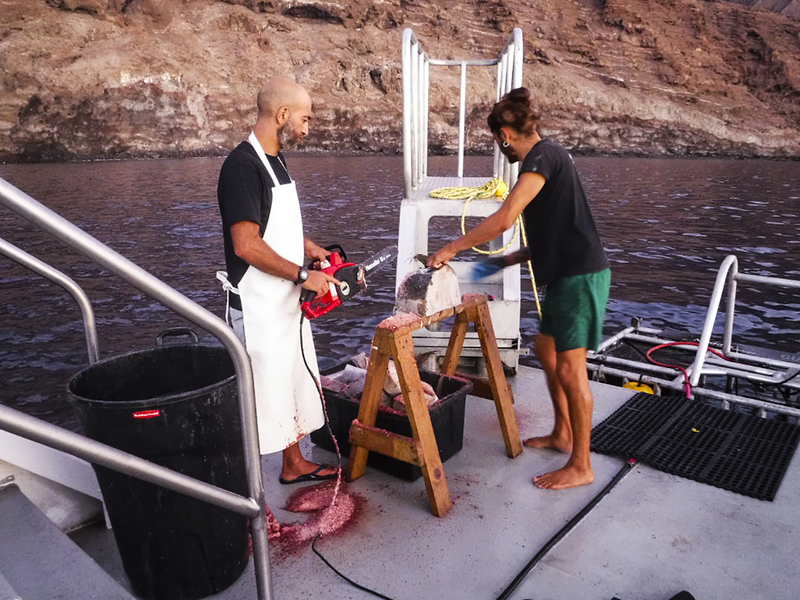 The sharks were around the boat before the cages were even open, before first light. In fact we could only see them because they came close enough to the ship’s flood lights on the back deck while we were cutting the tuna into small, bite sized pieces for great white sharks. The action was really hot in the morning with some less consistent shark activity in the afternoon. We saw more females than males and one very big female well over 15 ft long that was possibly pregnant, judging by her massive girth. We were able to identify her as #261 “Scarlett,” the last shark in the photo ID book. The excitement of today was contagious, our guests were cheering and hollering at every lunge and breach the sharks made at the bait and some of them were in the water for seven hours! Can’t wait to see what tomorrow holds! Wow wow wow! Today was a really exciting day, there were sharks everywhere! 6-7 sharks were around the cages all day, just face to face, I could see all their rows of teeth! All the divers went crazy looking up, down, all over to track the sharks swimming. It is awesome to see that beautiful blue dark of their eyes and feel the powerful energy in them. I am a lucky diver to see that. Today was great day!! 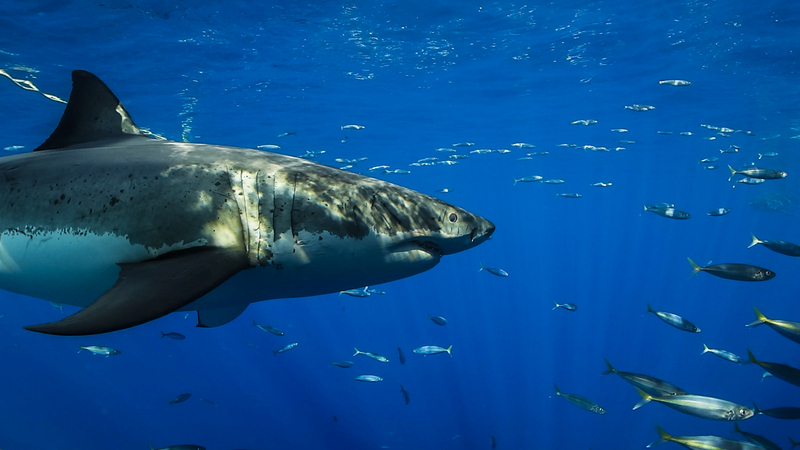 October the month of calm seas, high tides and beautiful bright full moons at Guadalupe Island, but it is also the time for big female great white sharks! Today we saw “Dotty” 5m-long shark that weighs more than a ton. She is massive and very impressive swimming around the cages. It is so peaceful with nothing to fear. She was not the only shark around, we also spotted 5 other sharks at once making it unreal with a school of mackerel and yellow fin tuna, each of them about 80lb at least, hunting with impressive speed. It was so incredible that our last diver got out of the cage at dark. We were almost thinking of giving him a pillow! The water temperature was 21°C and the visibility was 130ft. We are heading back to Ensenada after 3 days in the cages! 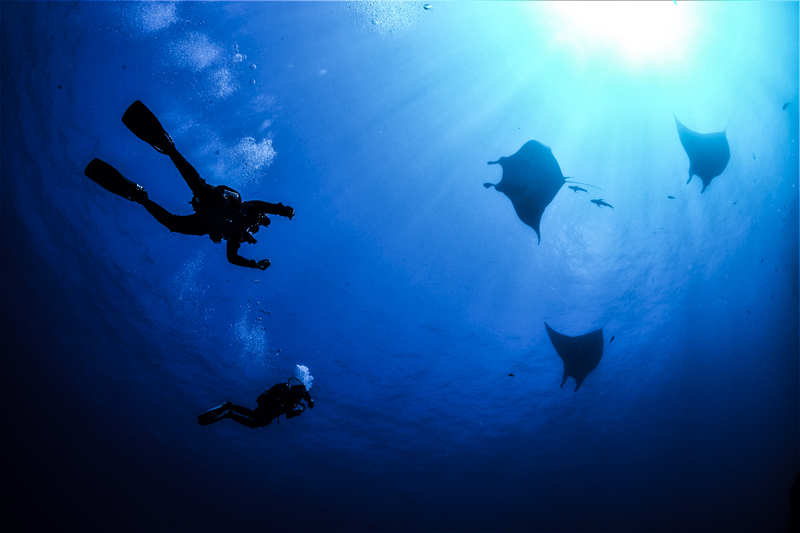 We enjoyed 120ft plus visibility all day everyday; it just keeps getting better and better. Loads of tuna and yellowtail jacks all over the show. As for sharks we have had so many its just been insane; I would say up to and over twenty different individuals visiting us each day. They are getting really big, lots of 15ft+ females like “Scarlett,” “Dotty” and “Lucy” (who made a return again to everyone’s delight) to name a few. Along with many adult and sub-adult males who were after the baits time and time again. Today we were also visited by a rather brave sea lion who hung around the boat for over an hour, repeatedly diving down near the sharks and coming over to the cages too a couple of times! It was a great last day to a great trip! Once again we started with an amazing first dive day in Guadalupe Island. I could count at least 20 different individuals white sharks. The most common and the rockstar again was “Lucy” who was around the cages all day. We also identified “Luca,” “Ropey,” “Michaela,” and “Lady Bolton,” among others. The visibility is incredible at more than 100ft and the temperature is not as cold as many would expected, around 70°F. I’m very interested in how the presence of the big females is effecting what we would normally expect in terms of behavour. “Lucy” is becoming the queen with her presence all around the different boats, but we are all really hoping to see if “Deep Blue” or “Tzitzimitl,” the 2 biggest great whites on record in Guadalupe, show in this last part of the season. Man it’s good to be back in Guadalupe! On this first morning of the trip we got up early for the tuna massacre to cut up our pieces for today’s wrangling. As I stepped on the platform at 6:30am nearly all guests were already up and excited for the day and watching the most amazing sunrise. It only took a short time until the first sharks were trying their luck to grab the bait and soon everyone had changed into their wetsuits and and switched their coffee mugs for cameras. Everyone was enjoying the sharks’ morning show! The most unexpected thing happened just before 8am. Out of nowhere a large female breached completely out of the water just starboard of the Nautilus Explorer! It was the most amazing sight with the sun perfectly in the background! Then we packed up and left as everyone saw what they came for… naaahhh, just kidding! This trip has only just started! 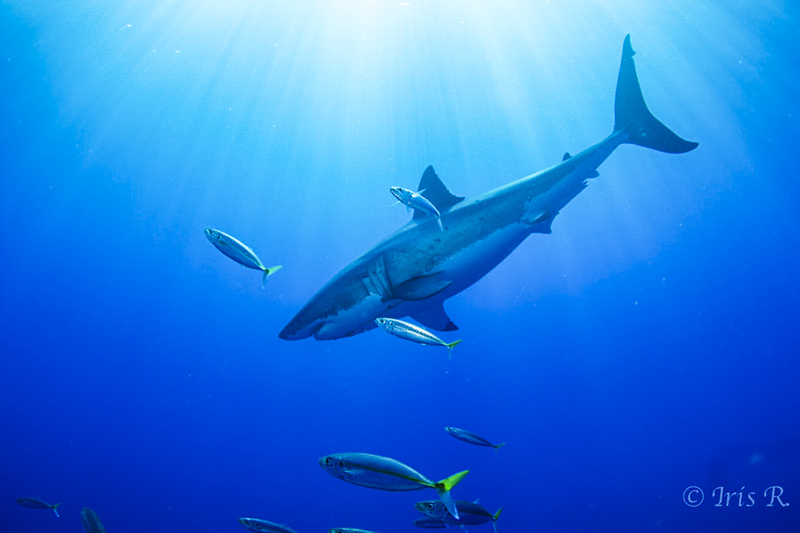 It is very nice to be back diving at Guadalupe Island! The new guests and crew members were ready to jump in the water, but this time it is even better because the ‘Big Mommas’ are showing up around the Nautilus Explorer, specifically “Donna” and “Scarboard,” who were with us most of the day, and the water conditions are perfect with clear water 100ft+ visibility and no current. We are hoping the conditions stay the same for the next couple days. Our hard work really pays off, just seeing the satisfaction on the faces of our guests. There were a lot of sharks today, especially a lot female sharks. One of them may even be pregnant (we all hope so!). Today there were more females than males and the differences in their sizes swimming by is amazing. There was also a lot of tuna hunting around the boat and cages. It is really great show that everyone in this world should see and enjoy! Today every diver was so happy to see “Lucy,” a fantastic grandmother of great white shark here at Guadalupe Island. She swims very near to the cages, making eye-to-eye contact with the divers and you can to feel her energy. There were also were a couple juveniles sharks around the Nautilus Belle Amie, and a lot of yellowfin tuna as well. It was a wonderful day today. The guests are also very happy that tonight is Mexican taco night! Everybody was excited early this morning, waiting for the surface cages to open at 6:30am. It looked a little like a car race! This is a good time to adjust your weight for the submersible cages and get used to to new gear or just practice your skills if you have not dove in a while. It was a slower morning until “Lucy” showed up like a queen with her score of pilot fish (we think there are almost 40 of them). The afternoon got really sharky as it has been for the last couple trips I have been on. The great whites “Kenric,” “Mike,” and “Rhett” are like the three amigos; we were surrounded by them and they were making it hard for the wranglers to keep their bait “alive.” We had a full breach and a lot jumps, it was amazing as always. Tomorrow will be another awesome day I’m sure. The water temperature is 21°C, and the visibility is 100ft plus. “I love Lucy!” That was one of my favorite phrases today on the Nautilus Belle Amie. She stuck around all morning and despite her deformed tail she was breaching out of the water after the bait. She swam around with an entourage of over 40 pilot fish. She cruises much slower than the other sharks which is why I believe she always has her mouth gaped open, to let more water pass over her gills to breathe. I think her slow cruising speed also explains her numerous pilot fish all around her body, riding her wake just waiting to pick off the scraps of her next meal. What a beautiful shark, hopefully she shows up tomorrow for breakfast! What a day! Over 10 sharks identified today and many more seen! Many breaches and many large sharks too. Three confirmed 15-footers! Great weather with blue skies for most of the day and clear seas with over 120ft visibility for most of the day also! One thing that we are also noticing about this season is the amount of Yellow Fin Tuna around. Everyday we are getting more and more with very large schools at the edge of our visibility range of over 50-100 individuals and around the ship and cages in groups of 20 +. These are large tuna too at around 30kg in size and some bigger. Even if we aren’t looking at a shark the tuna and Yellowfin Jacks are a spectacle all in themselves! Today is dive day one of the last trip for this contract. It is a bit of a sad day for me, knowing that this will be the last few days with these amazing creatures for at least a year. “Luca,” “Ropey” and “Lucy” were just a few of the great white sharks that made an appearance today. In total, we saw at least 10 to 12 individual sharks. It was a great first day.